I’ve had this grouse against most Indian men for a while. They behave like invalids in their own homes. They are probably ten times stronger than their mothers, sisters or wives. They lift tons of weight in the gym. Yet they cannot lift their plates from the dining table to the sink. They run in the treadmill for hours. Yet they will not stand for fifteen minutes with their wives to do the dishes when the maid is absent. They’re so agile in sports. But cannot bend down to pick up their own wet towels from the floor. They drive for hours together non-stop in their powerful cars. Yet will not drive to the corner of the road to pick up some groceries. I’ve been mulling over this for years. And I’m slowly seeing the light. Rewind to hundreds of years ago, when the women were so oppressed. Those women did not have a life. Education, knowledge, freedom of speech were all denied to them and their sole purpose of existence was to serve the men. Be it a father, brother, husband or a son, the man in her life at any point was her lord and master. They were literally imprisoned in the kitchens and made to cook & clean for the men of the house. Now, we all know what a woman is made of. Where she lacks in brute strength, she makes up with a strong will and a cunning mind. So they went along, played the dutiful wives & mothers. They did not step outside of their homes, cooked, washed, cleaned, laundered, brought up babies and kept house. But oh so subtly they made the men dependent on them without them realising it. They did pretty much everything for their men, so the men just cannot survive inside their homes without their women. Call it a survival act if you want, but the women chained their men to them by making them believe that they’re not capable of taking care of themselves. In short, they were invalids inside their own homes without their women. And some aggressive women came along and made rules that no man can enter the kitchens or try to do anythig that remotely resembled housework. But over centuries, we women have worked our way out to free ourselves. We can educate ourselves, go for jobs, excel in sports, run governments and have proved to men we’re their equals in everything but brute strength. But these poor, poor men still are rooted strongly in their age old beliefs that they’re invalids and cannot even make their own coffees at home. A few years ago, I had been to a wedding in a popular hotel in the city. The adjacent banquet hall was also hosting a wedding. But the difference was, the bride was an actor’s daughter. Not surprisingly, the hotel was packed with fans from the gates almost till the banquet hall, eagerly awaiting their favourite stars’ entries. Every single one of them was armed with their mobile phones, aimed and ready to capture their demi gods. I had to go down a spiral stair-case to reach my destination. Holding on to my sari dearly, clutching the gift in one hand and making sure my two and a half feet son was holding on to his dad and not getting stamped upon by eager fans, I went down the steps rather nervously. When I was mid-way, all the cameras started clicking violently and there was a major commotion. It was all a flurry of flashes and people brushing past me up the stairs and excited screams of people. As I neared the lower level I saw our own T.R. waving to his fans both sides and climbing up the stairs in style. Later, on the way back home I shared my amazement with my husband, about how T.R. was still so popular. I lurched forward as he screeched on the brakes. “Get off my car. Take an auto!” he said in an even voice. “What? Why?? ?” I looked at him in confusion. All I remembered was a flurry of white and lots of men running up. How did I miss him, I wondered in amazement. Seeing Endhiran took me back to that day. Rajnikanth is not numero uno for nothing. He makes no bones about his age. He’s definitely not handsome in the conventional way. But his energy and screen presence more than make up for any lack. My son is not very comfortable watching movies in the theatre. At 6, he’s still terrified of the noise. Last time, after barely settling down in my seat, I had to carry him home sobbing because he was terrified of Nazar’s introductory scene in a movie, thanks to the dramatic (and ear-shattering) music and wide-angle, tight close-ups! He came along this time because he’s older now and he’d seen the trailers and loved the fighting. The three hours we spent in the theatre was gripping to say the least. From the beginning to end there was no slack in the story. I’m not getting into the story because its been too widely written about. The movie is illogical in a few places (like how can a machine fall in love??? puleaaase!) but thoroughly entertaining. Every scene is a visual treat. I’d read reviews about Ash looking really aged in Raavan, but here she was as glamorous as ever and what clothes! The songs are nothing to write home about (not one is hummable or memorable) but the picturisation and the locations literally took my breath away! Wow! The special effects are mind-blowing. Truly international. Danny is uber-cool. And Sujatha’s dialogues are brilliant. But I feel the comedy track doesn’t really gel. A bribe of more Pepsi worked wonders(I know, I know, I’m a bad mother. But what to do? I had no intention walking away from the movie half way through) and in the climax scene, even he was glued to the screen. 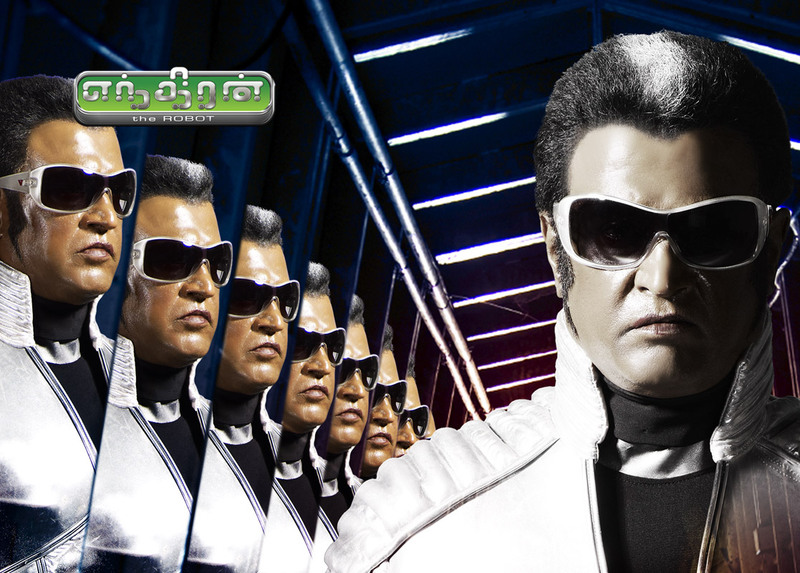 “Amma, this is so awesome!” he said, wonder-struck as all the Rajni robots joined together in magnificent formations. The snake particularly was big hit with him. Oh I just loved the evil Rajni! What style! What elan! Nobody could have done this role but him. I couldn’t help clapping and screaming to his manic laughter, much to my son’s disgust. The climax and the ending were just brilliant. Like I said, the movie did not slack even a bit. 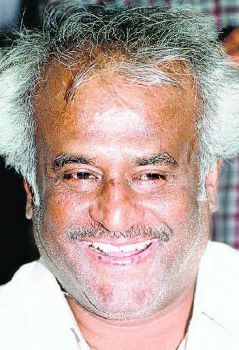 If I ever see him in person again, I may just fall at his feet and yell, “Thalaivaa!!!! Konnutteenga! !